Something must be done, obviously, and Major League Baseball owners are apparently pushing Commissioner Rob Manfred to make “bold” changes to address what they believe to be a pace-of-play problem caused by the increased employment of defensive shifts. But baseball doesn’t have a pace-of-play problem; it has a lack-of-action problem that an electronic strike zone can solve without taking umpires’ jobs. Batters aren’t looking to get the ball in the air more often to avoid hitting into defensive shifts. Batters are looking to get the ball in the air more often because there are fewer pitches thrown they are physically capable of hitting hard in the air. 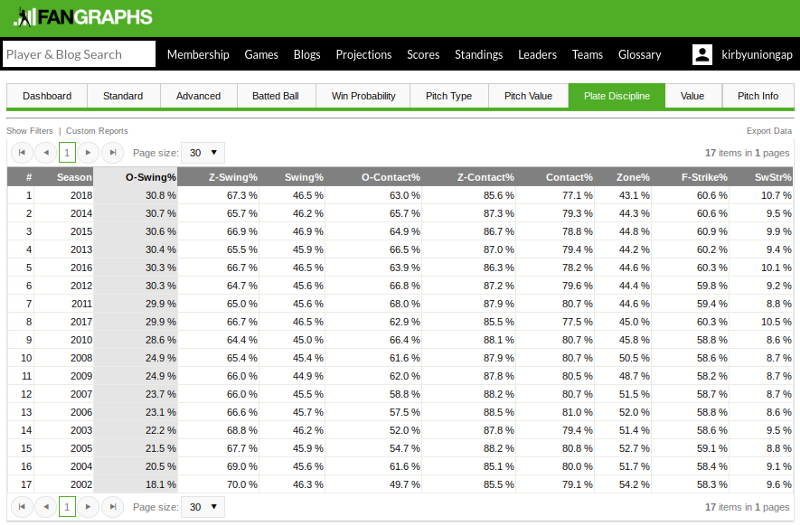 There are fewer pitches thrown that have extra-base-hit potential. Since 2002, swings on pitches outside the strike zone have increased 12.7 percent, resulting in an all-time low contact rate and all-time high swing-and-miss rate. Pitches these days are harder to hit than they’ve ever been. On average, they’re being thrown harder than they’ve ever been. Fastballs, split-finger fastballs, sinkers, sliders and even change-ups are being thrown harder in 2018 than they have since 2007, which is where FanGraphs’ dataset starts. 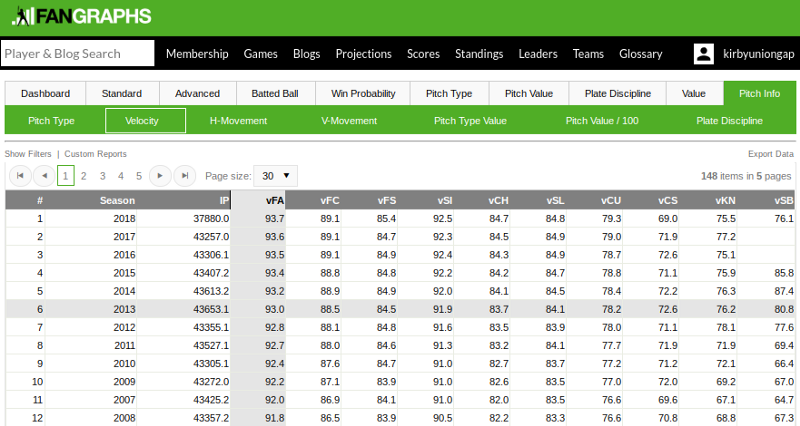 Pitches are moving more, too. Sliders, on average, have more horizontal movement than ever, with a focus on spin rate making pitches move more and making it harder for hitters to recognize pitches. Not only has fastball velocity increased almost annually in MLB, but almost every pitch is being thrown faster than ever before. Interesting ideas... it seems everyone and their mother have their own way to fix baseball. This one seems fleshed out and reasonable. I'm still waiting for a team to coach a new philosophy where they constantly beat shifts and force defenses to play them straight up. You can still have a few players who are aiming for power, but I'd like to see some more emphasis on getting guys on base against shifts and causing death by bunts [bunt hits, I mean] and singles. I heartily concur.I can see Daniel Murphy's point about not bunting because he's more valuable if he hits one in an alley- but he's Daniel Murphy. Taking a team like, oh, say, one that's not as good as the Cubs-- hmmm... With the plethora of banjo hitters the Twinks had this year, why not go for this kind of strategy? A return to the Piranha days would have been just the ticket for a moribund year like this. If they lose to the Yankees, for example, why not frustrate the hell out of 'em in the process, and who knows? Getting guys on base, anything can happen. They played around with the "opener" a bit so far, why not play around with dinkin' and doinkin' the ball around the yard, too? Maybe taking some of the "jack rabbit" out of the ball would be good too. I totally agree. A consistent strike zone would allow (disciplined) batters to lay off bad pitches and swing only at good pitches. I think that would ideed increase meaningful contact, at least for players with good plate discipline, and greatly improve the game. But no!The umpire called it a strike! Suddenly it's 2-2, not 3-1.The pitcher is no dummy -- he throws another pitch, in the same spot, or even another inch outside.The batter has no choice but to swing.The umpire has already shown he's expanded the zone, so you can't expect him to change now.But swinging is futile, of course.The ball darts three or more inches low and away,the batter strikes out or hits a weak grounder, and the at-bat is over.And all because of one bad call!That single missed call changed a 3-1 hitter's count to an out.And if there are men on base, it can change the course of the entire inning. Instead of first and second with one out, it's a man on first with two out.The next batter flies out, and the inning is over, and you're left to grumble about what might have been.How many times have you seen this happen? It was completely unfair, but there was literally nothing the batter could do.He had no choice but to swing at the next pitch, because even if the umpire knew he made a mistake, he now is going to dig in and defend the consistency of his strike zone. The pitcher knows this, the batter knows this, and the viewer knows this. And they just have to watch it play out. They also know that if the batter was unwise enough to express any disgust or disappointment at the bad call, he will be considered to have shown up the umpire, who can now be expected to call any ball within four inches of the plate a strike, lest he be seen as caving to criticism. Personally I could do without this human element. Just call a fair game, and let the best team win. Anything else is depressing and unfair. Now and then there is some gallows humor in watching a veteran pitcher mercilessly exploit the expanded strike zone.I would think that must become humiliating to the umpire. If consistency is such a point of honor, more so than accuracy or fairness, and they become unable to correct their mistake, how must it feel to have a pitcher force you to repeat it over and over? I don't blame the pitcher for doing this, mind you.I blame the umpire for being too proud to fix it. But is that what anyone really wants? Really? There was no way anyone could miss what was happening -- that huge strike zone was all the announcers talked about. But Gregg dug in out of pride, insisting it was fair because he was consistent. And Hernandez did what he was supposed to do -- make a fool of him.But it sure wasn't funny to the lefty-heavy Braves.It probably cost them a shot at the World Series. So yes, bring on the electronic strike zone!And if the umpire wants to remain proud and in control, give him a buzzer in his pocket that only he can hear, and let him announce to the world what only he knows. That just might work. Maybe he could even overrule the buzzer if he thinks the machines got it wrong (or he wants to prolong an at-bat instead of ending it with a fourth ball or a third strike, which statistics show umpires already routinely do). If umpires want to apply a higher standard to calls thatend an at-bat, maybe that's even okay.If nothing else, for those who love controversy, it could be debated at nauseum whether to adopt this as official policy. Personally I'd go with accuracy, though.Once batters and pitchers know they won't get the call just because of their reputation, or deferential attitude, batters will defend the plate, and pitchers won't nibble quite so much.If everyone knows the consequences in advance, they will take the firm strike zone into account and play accordingly.Allowing umpires to overrule the machine will only create confusion, and force hitters to swing at bad pitches again, at least if there are three balls, and allow pitchers to toy with batters off the plate because there are two strikes and the batter can't trust the umpire to make an accurate call.I think a consistent strike zone might reward good hitters with more opportunities to make good contact.And isn't that what we all want? Except for Gregg Maddux, the Yankees, and the Red Sox, of course.Okay, apologies to anyone who considers that a cheap shot, maybe it is. And maybe not. 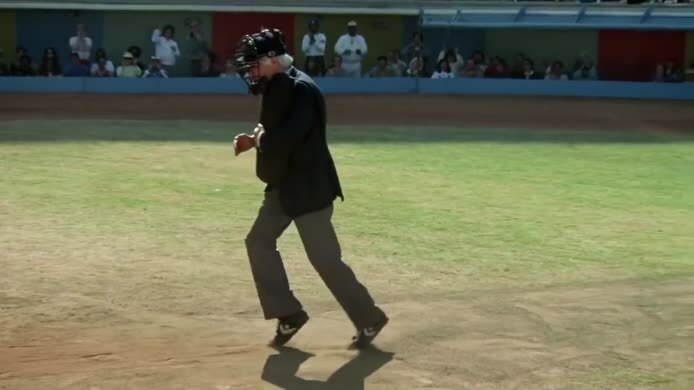 I'm a small-market fan, and I'm strongly convinced that big name players, and big name teams, get more calls from umpires, just like starsin basketball. Do you really think an umpire is as willing to ring up Derek Jeter or Big Papi on a borderline third strike as he is if the batter is some nobody? Of course not! You're not going to bench the biggest TV draw unless the call gives you no choice.Michael Jordan knew who was bringing in the fans, so everyone knew he would get the calls. If you disagree this happens in baseball and think I'm just a whiner, call my bluff: make the strike zone indisputably fair. I would love to have some team blow up the current concept - go with Whitey Ball - the old Cards, or the A's of Rickey and Reggie, or the Go - Go White Sox of Aparicio and Fox.Get on base, hit 'em where they ain't, steal, hit and run, field, and play fast ball.It might just put some of these follow the trend teams in shock!